Nintendo's hit brawler may have already maxed out its roster. The original Super Smash Bros. on the Nintendo 64 featured 12 playable characters from a variety of Nintendo franchises. 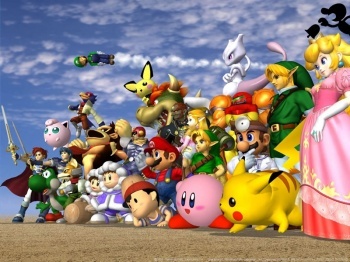 Super Smash Bros. Melee made use of the Gamecube's hardware to realize 25 characters, more than twice the original cast. Super Smash Bros. Brawl upped the count to 35 playable characters on the Wii. So with a Wii U Smash Bros. title in the works, how many new characters will this installment bring? Well, possibly none. Series creator Masahiro Sakurai is cautious about continuing to expand the already massive list of characters. "It isn't a matter of 'if the next game has 50 characters, that'll be enough,'" Sakurai said in an interview with Nintendo Power. "There is a certain charm to games that have huge casts of playable characters, but they tend to have issues with game balance and it becomes very difficult to fine-tune each character and have them all feel distinctive." "In terms of quantity, we've probably already reached the limit of what's feasible. I think a change of direction may be what's needed." These are wise words to fans of fighting games. Many criticized Super Smash Bros. Brawl for having some notably unbalanced characters, while other characters were carbon copies of each other (I'm looking at you, Team Star Fox). With a focus on quality over quantity, and some fresh ideas from co-developer Namco Bandai, the series may be in for some unexpected turns.